I actually just picked this one up from the library. Looking forward to it! Reid's After I Do was in my top three reads of 2014. Obviously I must read her other book immediately. It's the only one of Rowell's books I haven't read yet. His wit may be unrealistically awesome, but I love a great exchange of witty banter. I actually already saw this film, and loved it. Now I want to read the book. Fact: I've never read anything by Gayle Forman. Must change this fact. I had an unlikely source recommend this book to me, which makes me extremely curious. I've heard so many great things about his work, though, admittedly, his death makes this book a little difficult to choose, all things considered. I've heard from many people that this book will likely be on school book lists, so if my daughter is going to read it one day, I'd like to know what it's about. Markus Zusak won my unconditional love with The Book Thief. Obviously I have to read this other work. What other contemporary novels would you add to this list? I read very little contemporary, so if you have a favorite that I need to read, then please do let me know! Chances are I haven't read it yet! Good list. I read Eleanor and Park and Speak. Those are both awesome books! Glad to hear it! Something about the idea of contemporary novels fails to get me excited, but I'm rarely sad when I do read one. I'd like to expand my reading to include more of these! Definitely do check out TJR!!! She is seriously so amazing. After I Do was one of my favorite reads of the whole year last year. I'm like you, I don't dabble in contemporary too much either. I'm usually disappointed, but sometimes I find a really good one. I love all things Markus Zusak! I need to read Eleanor and Park too. Yeah, I tend to go into contemporary novels hesitantly and skeptically, but I have found some great successes this past year. (Fangirl, After I Do, Aristotle and Dante, etc.) Those make me want to give the genre more effort. It's so funny that our lists have no overlap. I hope you get to To All the Boys I've Loved Before and Eleanor & Park soon. They are two of my all-time favorites. I have TATBILB on my nightstand right now! Hoping to start that one tomorrow. I don't read a lot of contemporary either. I like fantasy, but I do like contemporary every now and then. I really want to read Eleanor & Park too and I am the Messenger. I've read Speak and it's very profound, I guess. That's not really the word I'm looking for. The story is heartbreaking, but I got a lot out of it. That's basically what I've heard about Speak. It sounds like it will be a difficult but important read. I'm looking forward to I Am The Messenger and Eleanor & Park too! 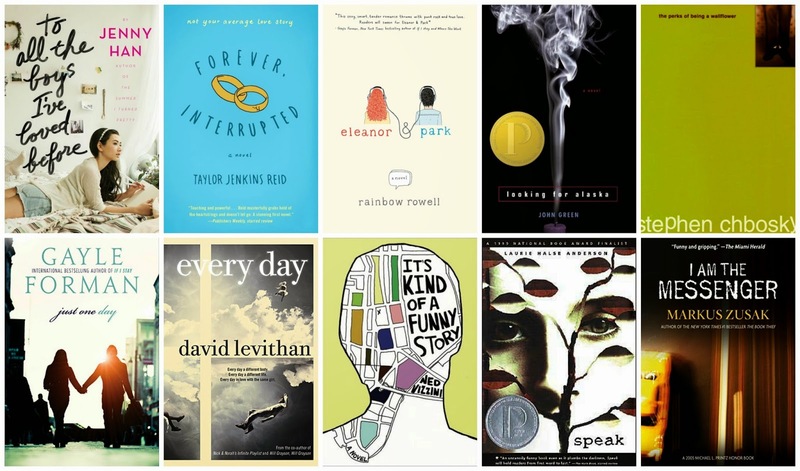 Eleanor and Park, and Looking for Alaska are both great. To All the Boys is on my TBR this month. Glad to hear the good reviews! TATBILB wasn't very high on my list initially, but all the ridiculously positive reviews have changed that.